Spectrum Miami, a curated contemporary art show in the heart of the Wynwood District of Florida, on December 5 – 9, 2018. A resident of upstate New York, Michelle Vara’s recent work reflects her three year study of consciousness and the varied dimensions of untapped human potential and how these are visually communicated through mixed media sculpture and unique techniques of painting with the artist’s carefully researched and personally developed non-toxic, road tar-based paint. 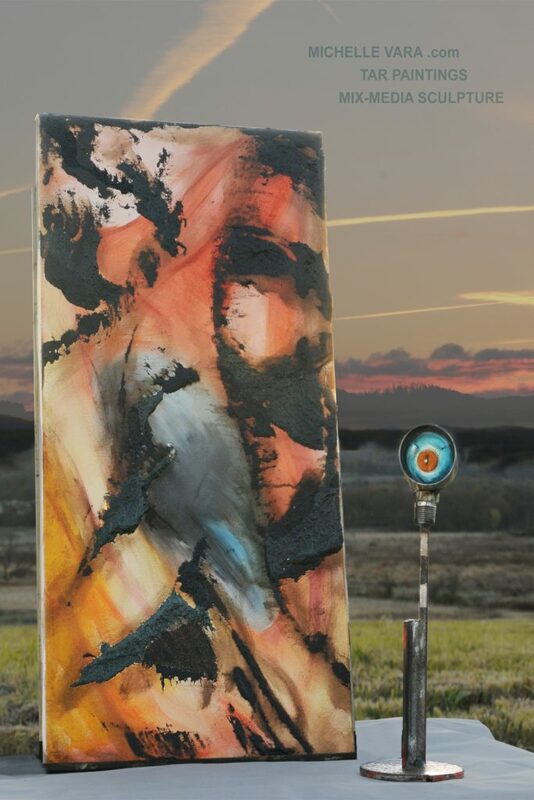 Using an automobile hubcap as the paintbrush to apply the custom developed tar-based paint Vara forms a place in each painting where elements of reaction and dimension – physical and metaphysical – find context reflecting principles necessary for accessing inner core intelligence. Via this sui genesis approach to both the material and application of paint in conjunction with the practice of automatic drawing developed by the Surrealists the artist explores a hypothesis on energy formation and generation – potential – contained in human consciousness. In mixed media sculpture, Michelle Vara forges additional pathways to access these insights aided by the use of recycled materials. By calling upon the energy embed by history within each component the artist furthers the idea objects are vessels for memory providing personal connection which transports the onlooker to uncharted places in unexpected ways. Michelle Vara’s created The Tribe collection as an intersection of sculpture and jewelry inspired by the artist journey cross country in 2018, and more specifically Michelle’s time spent in Arizona exposed to kachina mythology of Pueblo Indians. Michelle has always been interested in the story of object and tradition and ancestral spirits, her interests are sparked by artist like Hilma af Klint, as in the spiritualist practice as a medium and reflect an effort to articulate mystical views of reality through visual output. (1) Each piece in this series is conceived through meditation and drawings. Michelle has been working on a theory of object, that contains memory and conveys in real time to and through an individual. As Michelle read into American Indian lore and traditions, she started thinking how Kachina theory crossed into her object as a vessel idea. Michelle then started looking for a common object that contained energy and is accelerated by intimate interaction with humans, in that she choose the spoon to create the “Tribe” collection. The “Tribe” is supported by a structure that uses reclaimed materials that hold metaphor, history, experience, and reference. The Michelle reworked the spoons into amulets that can be worn as jewelry. The spoon serves as an intimate vessel for quality of being, capturing life force, exuberance, memory, ethe motion of human daily life. Michelle chooses spoons for their found color, finish, size, shape, and how they have worn through use. 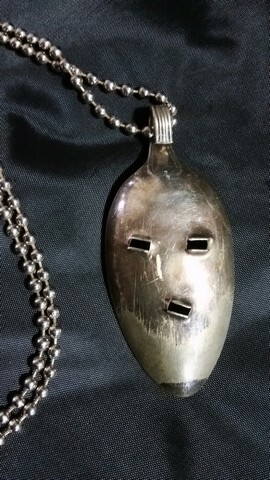 The spoon amulet connects in many ways like, motion energy and sound waves of a bell-like clanking when one stirs. Stirring opens a vortex of energy relationships and references. The spoon forms a personal relation through the mouth, saliva relating intake or feeding. The spoon amulet also considers family, familiarity, task, experience, and is exposed to all human emotional states, going mostly unnoticed. The Amulets are then incorporated into a sculpture framework as a holder which allows the amulet to convey the communication further. 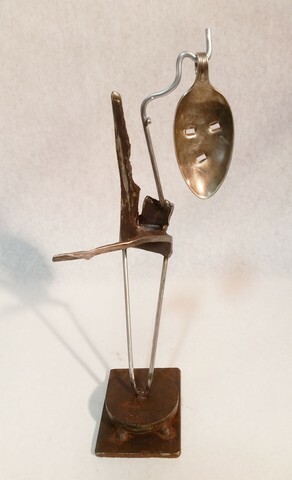 You can see more of the series in the sculpture art portfolio section of this website.